You will be given a free reference e-book to read which has 171 pages And the test will be based on that e-book. Ethical hacking refers to a process which aims to protect computers and networks from attacks made by unethical and harmful hackers who tend to illegally penetrate systems, databases and computers as a means of accessing sensitive and private information. Professionals who are trusted by business organizations to do this job for them also possess the technical skills of unethical hackers but they make it a point to utilize their skills and knowledge as a means of protecting the networks and computers of the organization through which they are a part of. The most trusted professionals in the field of ethical hacking are those that received a professional certification, thereby transforming them into certified experts in the industry. If you want to become a certified ethical hacker (CEH), then you should know that you will be required to take a hold of a professional certification. To become certified, you will need to undergo the necessary training and education and pass the certification exam linked to ethical hacking. Once you become certified, you can start performing essential functions like preventing unauthorized and harmful penetration into computer systems and networks, finding computer security vulnerabilities and fixing them. The good thing about this is that you can now easily learn everything about the field since Brainmeasures, with its legitimate and highly recommended CEH practice course, can help you deal with the complexities in ethical hacking, pass the ethical hacking certification exam and work as a certified expert in the field. 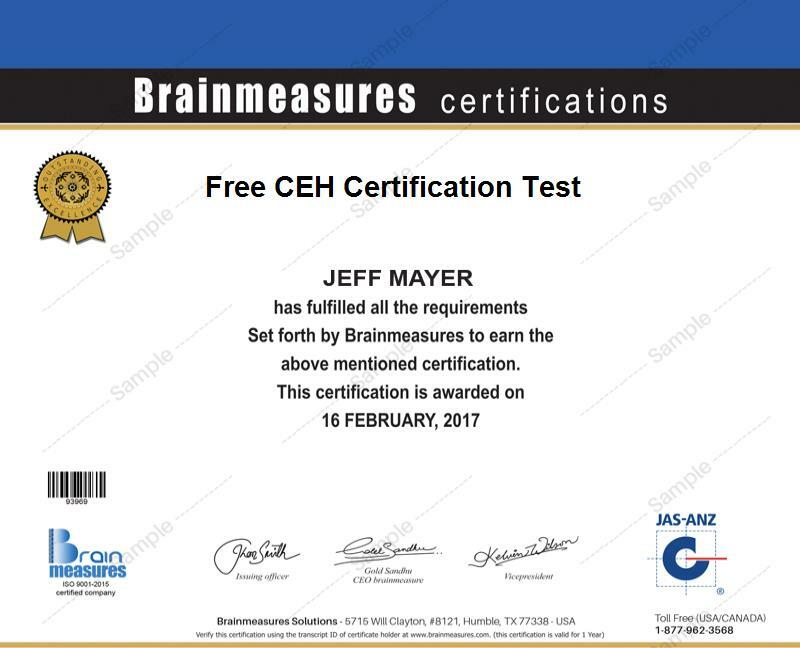 The free CEH practice course which is developed by Brainmeasures is really beneficial for you if you really have an aim of passing the ethical hacking certification and work confidently as a certified ethical hacker. This practice course comes with the most comprehensive study guide that explains in full detail all aspects and areas linked to ethical hacking so understanding the whole field will become a great possibility. It also comes with a CEH practice test which works in your attempt to completely prepare yourself for the actual certification exam. The free practice test which is offered by this legitimate online certification company is developed by real experts in such a way that you will have an actual feel of the usual questions and areas tackled by the actual exam. This is extremely beneficial for you especially if passing the ethical hacking certification has been included in your major objectives. How to gain and maintain access to computer networks and systems? Anyone who dreams of passing the ethical hacking certification can take up the free ethical hacking practice course available at Brainmeasures. This free practice course and exam will strongly benefit all aspiring and existing security officers and professionals, website administrators, auditors and all other professionals who wish to pass the ethical hacking certification so they can finally hold a certificate which makes them more effective in improving the integrity and level of protection for all computer and network infrastructure. Upon successfully passing the actual ethical hacking certification, you can also start to earn big. Your received certification allows you to hold the position of a network security analyst and receive an annual salary within the range of $45,000 to $96,000. Working as a certified ethical hacker (CEH) is also very rewarding because the salary offered for certified professionals in the field can reach up to $132,000 yearly.